I hope everyone had a safe July 4,,,,here’s a picture of N20 engine mounts from a F10,,,,the problem was the customer said the car was running rough,,,,the rough running got worse when you shifted it back into park,,,,in drive you could still notice it but not as bad when it was in park,,,,I checked out the engine mounts and found the passengers side mount was collapsed,,,,you can see the new mount on the left side is taller then the old one. Here the new engine mount is installed,,,,you can see a gap between the engine mount and mount support bracket,,,,you can see the 4 black marks where the old collapsed engine mount was hitting the mount support bracket,,,,can you do this repair at home yes you can,,,,when replacing the passengers side you have to support the engine and remove the engine support bracket at the same time,,,,,,the drivers side is a lot harder to replace . 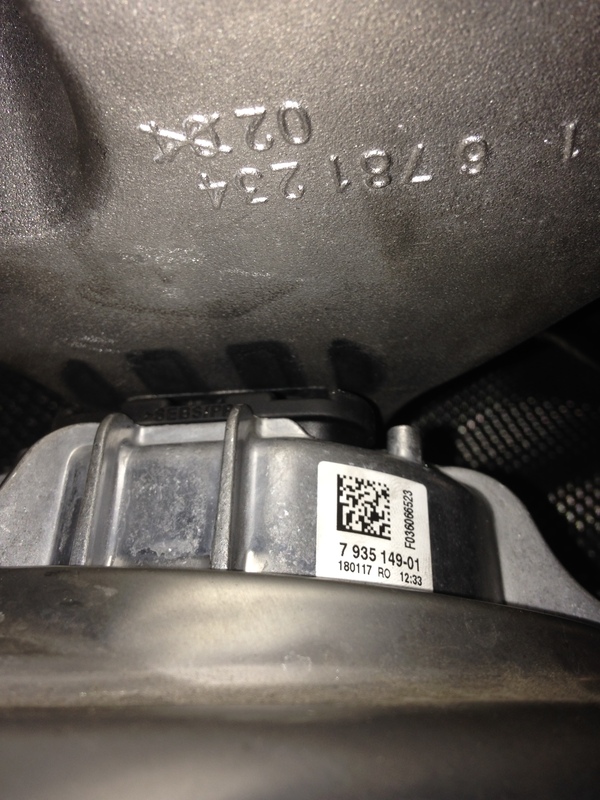 This entry was posted in Uncategorized and tagged engine mount, motor mount, N20. Bookmark the permalink. How this is going to look for DIY? How hard is it? Dealership diagnosed as bad mounts on my F10 528i too. I can feel vibration during cold start when gears are changed to D or R. More colder outside, more worst is the vibration. But it goes away once engine is warmed up. Is it really motor mounts? Thank you for the response. I’ll find a good indy for the job. 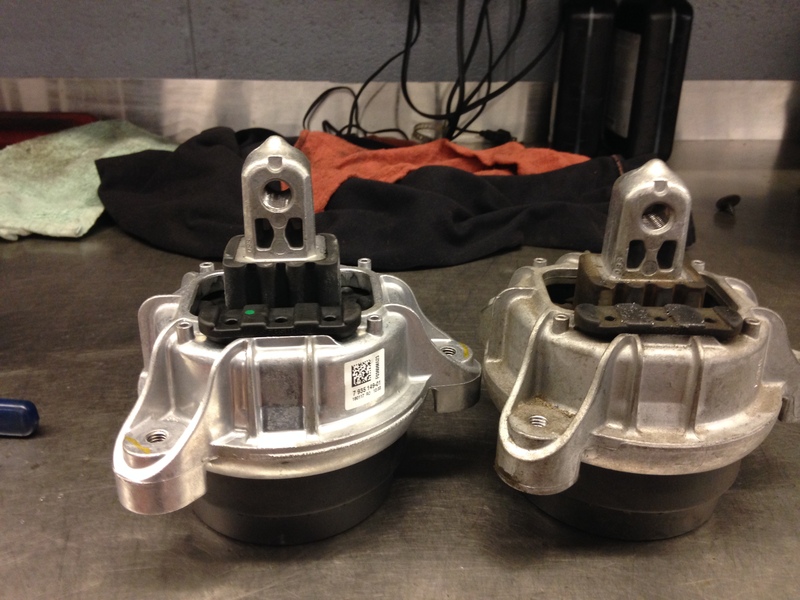 I bought oem motor mounts on ebay via bmw dealership in florida for a real good price($158/pair with ebay 20% coupon). I’m leaning towards using harbor freight engine support bar for lifing engine up from top and change one mount at a time. How hard it’s going to be? And I have seen plenty videos using support bar on fenders. Just curious if fenders are strong enough to hold the bar while lifting engine. Just a quick question, does this mount replacement requires the replacement of any bolts? Thank you for all these valuable information and I really appreciate it. Just one quick question, is engine tow hook suppose to thread in all the way down? Mine is not threading all the way down. The hook design stops screwing all the way in. About 1/4 (about 3 threads) of the hook screws in and the bulged part @ middle of the hook gets stopped by a riser on the engine block right next to tow hook screw hole. Is that right way bmw does it? Any insights is highly appreciated. On my 2012 528i, the tow hook will not thread into the hole by the oil filter. The tow hook’s thread diameter is too large. The tow hook was machined for clearance as mentioned above. Was the hole for the N20 lifting eye smaller in 2012 than the later model years? And the tow hook does thread into the front bumper. Are there different tow hooks? I assumed that anything called a tow hook was meant to be used as a front tow hook for the car and it doubled as a lifting eye for the engine. Is there a part number for the lifting eye for the N20 engine? In case it matters, the diameter of the threaded end of my tow hook is 0.767 inches or ~19.5 mm. This is the tow hook from the tool kit mounted in the trunk lid. BMW tow hook 72-15-7-203-519 fits the N20 engine lifting eye hole. No modifications to the tow hook are required. Its outside diameter measures 0.616 inches or 15.6 mm. Both of the engine mounts on my F10 have failed. To change them it doesn’t appear that the engine could be raised enough to get the mounts out of the pocket in the sub-frame. Am I correct in assuming that both support arms need to be removed to get the mounts out?